Not many towns are built with the purpose of enticing visitors, but that’s exactly how Banff in Alberta, Canada came to be. William Cornelius Van Horne, general manager of Canadian Pacific Railway (CPR) recognized the tourism potential of the Canadian west. “Since we can't export the scenery, we'll have to import the tourists,” he said. From that vision a succession of lavish resort hotels was built along the railway line through the Rocky and Selkirk Mountains. 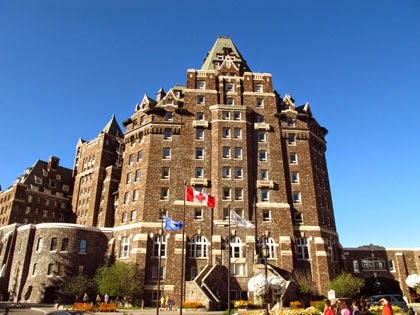 First among those was the Banff Springs Hotel, which today is a UNESCO World Heritage Site. 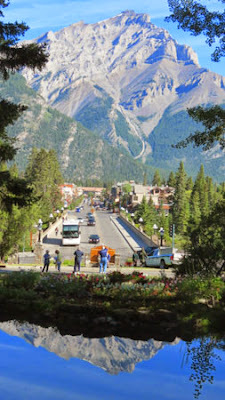 Once you arrive in Banff and see the spectacular scenery of Bow Mountain standing sentinel at the end of Banff Avenue, you understand the attraction and reasoning of the railroad officials. View of Banff Springs Hotel from Bow River. 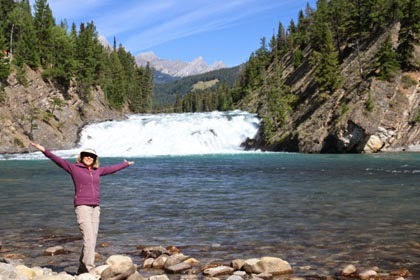 During our stay, we never tired of the scenery, and if you do nothing but wander the streets of the city, soak in the hot springs, or play golf at the foot of the mountains, you’ll have great memories of this Canadian national park. But there are plenty of trails to hike and places to explore at this alpine destination. Here’s a one-day plan of experiences you might enjoy in Banff. Trek downhill over rocks at Surprise Corner to the Bow River below (it’s not difficult). 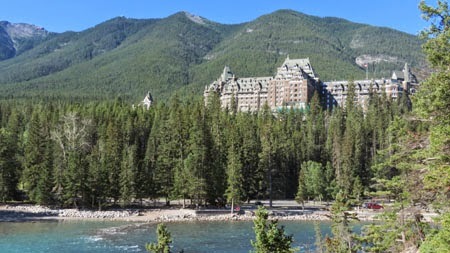 The area opens up to stunning views of the iconic Banff Springs Hotel. Then drive to the other side of the river for a better look at Bow Falls, actually a wide cascade. Local families and visitors make use of the river for a variety of water activities. 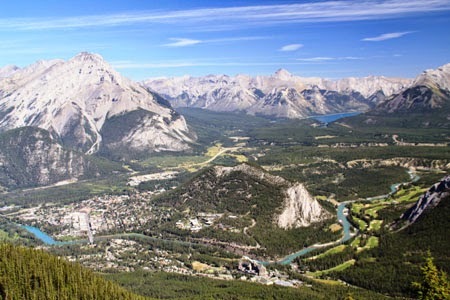 Panoramic view of Banff and valley from top of Sulphur Mt. For a panoramic perspective of Banff and surrounding area, take the Banff Gondola on an eight-minute ride to the top of Sulphur Mountain. 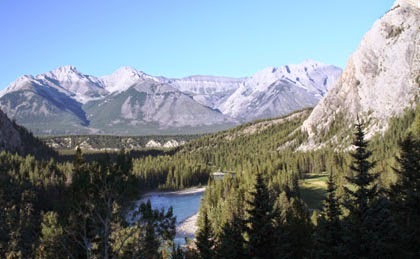 At an elevation of 7,495 feet, you’ll have 360 degree views (looking east to west) of surrounding peaks, Lake Minnewanka, town of Banff, and Bow Valley, a welcoming corridor for people and wildlife for more than 10,000 years. After disembarking the gondola, you can walk up several levels of steps on the boardwalk to a higher observation area. 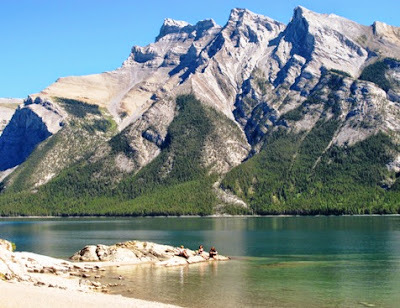 Lake Minnewanka is surrounded by sharp mountain peaks. Pack a picnic lunch and head to Lake Minnewanka, the largest lake in Banff National Park, spanning 15 miles in length and reaching 466 feet deep. An interpretive boat ride on the lake provides information about the history, native folklore, and geology of the area. When a hydroelectric dam was built in 1941, the lake level to rose 98 feet and covered the town of Minnewanka Landing. As you walk along the lakeshore trail, bright turquoise water surrounded by sharp-peaked mountains makes for idyllic scenery. Wade into the cold water, if you dare, or just soak in the sun on any of several rock outcroppings. The Fairmont Banff Springs Hotel retains its historic ambience. Even if you’re not staying at the Fairmont Banff Springs Hotel, walk through its historic, art-filled corridors. Pause for a pre-dinner drink or snack on the outdoor deck overlooking Bow River. Admire the landscaping filled with colorful summer blooms and a multitude of overflowing hanging baskets, just another reason why the legendary “Castle in the Rockies” has been attracting visitors to Banff for more than 125 years. Outstanding view of Bow Lake from the hotel's outdoor deck. Visited here in 2005 - the scenery is a knockout! I've been the last two summers and never tire of the scenery. The Canadian Rockies truly have that "wow" factor.